OpenSky’s knife sharpener offer to people who follow me there forced me to think about sharp knives (I had to write the copy). Normally, I only think about sharp knives when they aren’t. So this post is simply to clarify what is rarely stated on cooking shows, in magazines, in the recipe columns of your newspaper. If you want to make cooking easier and safer, use very sharp knives and learn how use a steel (it takes practice—start slowly, you don’t have to do it fast like a show-offy chef). It only takes five seconds. When you use a dull knife, you tend to have to press harder on what you’re cutting, which results in slippage and ragged cuts (nick yourself with a sharp knife and the wound is back together by the end of the day; unless you remove an entire digit, of course). Look at the photo above. 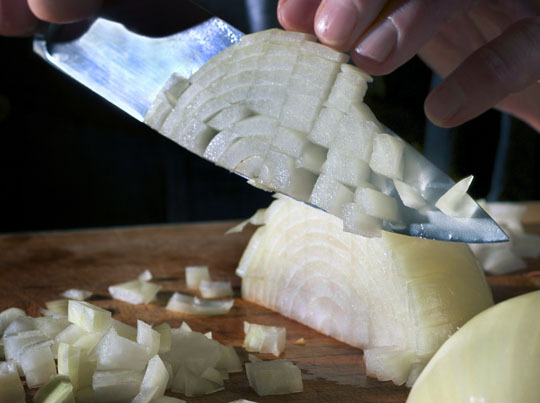 A dull knife will smash through the onion cell walls rather than slice through them, losing more juices, so it’s arguable that a sharp knife actually results in better tasting food. Bottom line: there are enough frustrations in the kitchen. Don’t compound them by using a knife that can’t slip through the skin of an old tomato. If you want to enjoy cooking more, get your knives sharpened. More important: if the person you love is doing the cooking, sharpen their knives. I’ve said it before and I’ll say it again. If your sweetheart is the cook, take advantage of this fact: Nothing, nothing, says I love you like a really sharp knife. Not to a cook, anyway. For me, this is the issue : Do I want to put a sharp knife in the hands of the average home cook? I used to preach the virtues of using a sharp knife to anyone who asked or showed interest in knives, and how learning to properly sharpen a knife is indispensable in the kitchen. But it’s not just the sharpness of the knife, but also proper knife skills and handling. How to hold the knife, how to hold the food being cut, what motions to us. These are skills that must be learned along with keeping one’s knife razor sharp. As for sharpening, that can be simple (Chef’s Choice) or it can approach zen-like mysticism (Diamond stones, whetstones, grit progression, stropping, stropping compounds, honing rods, bevels, secondary bevels, asymetrical bevels). Whatever works to dice your onions…. I’m embedding a quick How To demo below which Donna shot with my iPhone, but I also show how to steel a knife; they’re both important skills. (This particular sharpening tool has two sides, a fine and an extra fine; to keep the video short, I only showed six swipes on each side of the blade on extra fine to finish it.) I found an awesome wet grind service in Cleveland (Ambrose Antiques on Prospect across from Convocation Center.) where I paid for it, and it was worth every penny. Now I have a cool new “stone” that OpenSky sourced and that I love (not only is it dusted with uniform diamond particles, it’s perforated, an old patent that DMT took over, works astonishingly well). I just received an email from Andrew–yesterday’s special discount on them sold out in hours but I’ve just learned they’re working with DMT to release a few more today at the same price. Regardless how you get the knives sharp, a proper service (please don’t take them to your hardware store; they can sharpen lawnmower blades, but not knives), or your own stone, get them sharp. Keep them sharp. Boos cutting boards are high quality thick cutting boards that I use everyday. Another advantage of a sharp knife, as pointed out by an emergency room Doctor, is if you cut yourself, you end up with a clean cut, requiring a minimum amount of work to repair. My knives go to Warren’s on a regular basis, and I know how to use both a steel and a stone. By the way, I was cutting a dry cured ham from Charcuterie. I used to sell Cutco, and the line we were taught to use was that a dull knife is far, far more dangerous than a sharp one. Yes, it is counterintuitive, but it’s also 100% true. Recently purchased a set of stones and am learning to use them to sharpen my knives. I have several older, crappy knives to practice on along with one decent 8″ Chicago and a 6″ Henkel intl. I added an 8′ Messermeister at the same time I bought the stones. I love the Messer. though I haven’t had to doing anything but hone to keep it sharp so far. I have sharpened the others and they actually came out sharper. Not like the new Messer, but easily cut through a soft tomato. It’s not that hard, doesn’t take long and is more than a bit fun. Most folks don’t hone their knives often enough to keep them sharp. steeling once a month. Huh? who recommend steeling a knife once a month?! Aida Mellenkamp on her show ‘Ask Aida’. Please be careful sharpening a Japanese style knife in this manner. I ruined the first MAC knife I purchased by using a stone. this “stone” doesn’t scratch up a knife the way conventional stones can. I’ve done this too! Perhaps so, but Japanese-style knives are often (i) made of much harder and more brittle steel, and (ii) single beveled. As such, sharpening a Japanese knife is a whole different ballgame, and attempting to sharpen one using the methods for sharpening a western-style knife will likely chip or otherwise damage a Japanese knife. I’ve heard that Japanese knives are beveled at a different angle too – something to do with the quality of the steel, perhaps? Or did I just make this up in my head? Well, now I’m worried because my favorite knife is a MAC 8″ chef’s knife and I just bought the the DMC sharpening stone on Open Sky yesterday to sharpen it and others I have. I don’t have much experience sharpening knives but MR’s video and others on Amazon made it look pretty simple, and I’ve got a few knives I love less to use for practice. But given Joey’s comment, I’m now worried my beloved MAC will require skill I won’t be able to muster or that I’ve chosen the wrong tool for the job. Anyone have any tips? wow. common sense really. I’ve long used sharpening stones and a steel as dull knives are a pet peeve of mine. since picking up a professional grade sharpening tool for my woodworking handtools. a sharp knife is moments away. since it’s so simple I always volunteer to sharpen someone’s knives when I find they have NONE! astounding to me really, it makes such a big difference. I know a lot have poor feelings towards automatic knife sharpeners such as Chef’s Choice because of the amount of metal they remove, but I contend that they are great tools for those who aren’t knife gurus. The models with the “strop” feature work well to hone an edge without removing much material. The more harsh courses in the machine only need to be used once every few months, especially if the knives are regularly steeled. Personally, I like using the Chef’s Choice to quickly get an edge on a blade. From there I polish is with a 6000 grit stone and finish off with a leather strop. I keep a two sided leather strop in the kitchen in place of a steel as I find it does a great job of both keeping an edge straight and keen. I use mostly thin Japanese style blades with hard steel, and I don’t think a traditional steel works as well with these type of blades. I have actually been wondering about the best way to sharpen my knives. Growing up I never saw it done, and at that, I have never seen anyone do it around me. The one thing is, I’m very clumsy at times, and I hope I won’t lose a finger! keep your fingers behind the blade edge and you won’t! Most home cooks are fearful of attempting to sharpen their own knives, and honestly, I don’t blame them. That twenty-degree angle is pretty difficult for a novice, at least without breaking out a protractor. Here,in northern California, many of the full-service supermarkets like Raley’s will sharpen customer’s knives in the meat department. Let me just add that butchers really know how to sharpen a knife! Usually you have to leave them over night, but for a free and really good sharpening, it’s worth being knife-less over night a few of times each year. Honing on a steel is less intimidating and should be done prior to each use (and don’t forget to wipe the tiny metal filings off) to keep the edge razor sharp. actually, the DMT guy suggests putting two quarters on your stone. rest the top of the knife on the quarters, that’s how to teach yourself the perfect angle. Can’t I just use a roll of pennies? I don’t think I have correct change. Darn!!! Just logged in to OpenSky……sharpening stones sold out!!! I’m on the waiting list for it to be offered again. Will that really happen? Thanks for offering all these wonderful products and thanks also for your fabulous site. yes, they will especially if people request. just let them know. Forschner makes some good, cheap knives that many people in the food industry use because the hold an edge for a long time and have a plastic handle, which makes them practically indestructible. They aren’t the prettiest and many knife snobs turn their noses up at the plastic handle, but I’ve heard that many butchers swear by them. Good places to look for inexpensive knives are restaurant supply stores (many of which are open to the public) and factory outlet stores. I got a good deal on some Henkels knifes and found out later that it’s because they were made at their factory in Spain, not in Germany. Seconding the Forschner recommendation. I’ve been using and abusing them for over fifteen years with no complaints. Third on the Forschner recommendation – good quality steel that keeps an edge at a low price. Pampered Chef has a line of forged German steel knives that I really love. They also have a honing tool and I personally use a steel. Find an excellent knife sharpening service that hand-sharpens; they’ll be able to remove the nick and reform your edge so that you don’t have to replace the knife. I took it to the guys at Chef’s Toys. At first the knife guy said it was a goner and I left it for him to dispose of. When I came to pick up the rest of the knives though, he’d taken it as a challenge and had managed to grind it down into a usable knife again. It was a smaller knife, true, but it was usable. Another resource for Clevelanders: There are several itinerant knife-sharpeners who work a few hours a week at places like farmers markets. I use Steve Bottorff, who publishes his schedule at sharpeningmadeeasy dot com. Most recently, Steve repaired a nick in my 8″ Wusthof. I’d butchered a rabbit with it, and I must have damaged it going through the leg bones. Guess I need a butcher knife for that kind of thing. As long as you’re not worried about getting it wrong (and maybe eating up some of the steel on your knife) the first few times, learning to sharpen is a rewarding and worthwhile investment. I’ve used these DMT stones for a while now as they’re the standard coarse stone used to set an edge at Stoddard’s and cannot say enough good things about them. They won’t polish like a waterstone will, but they cut faster than any ceramic or clay based stone I’ve ever used. Just be aware that while these stones don’t scratch the same way a whetstone does, they also don’t polish off a trailing burr the way a whetstone does. To work around this in a pinch I pull the nearly finished knife through the edge of an end-grain (NOT edge grain) cutting board or butcher block. The knife will slice through the wood fibers with no damage, and the wood will gently abrade the burr off. “…20 degrees, use your common sense…” That may be the most difficult part of the process. My Shun knives require a 16 degree angle. Globals probably use a different angle as well. Any tips for hitting the correct sharpening angle? Two dimes or pennies instead of two quarters. Run a magic marker all along the flat part of the edge (the bevel). Do a couple of passes on the sharpening stone. Now look at where the magic marker has been abraded away. This will tell you very quickly whether you need to raise or lower your angle to hit the bevel evenly. It’s an extremely useful technique for figuring out what’s going on with your sharpening (e.g. are you actually hitting the edge or just polishing the sides?) for anyone but especially when you’re just starting out. Also, a proper honing steel should be smooth. You just want to bend the edge back into alignment, not to remove metal. I believe both HandAmerican and Idahone make proper ones. In a pinch the back of a plate works nicely. I often use a steel, but I have never used a stone. If I only use a steel, what am I missing? I assume a stone needs to be used less than a steel? Or should the two always be used in conjunction? I bought a second set of knives when I became a personal chef and they live in my car. So wherever I go (including my mother’s house) I have sharp knives. BTW, the steeling technique I learned is rather odd, but easy for home cooks. Hold the steel vertically, point down in one hand and stroke the knife from top to bottom, swapping sides with each stroke. they taught us this way at culinary school. they taught us the usual way, but for use in the overcrowded school kitchen, the vertical method was required for safety sake. The Warthog V-Sharp is an excellent tool for keeping a consistent angle. I’ve spent many an evening sharpening my knives after a day working the line at a restaurant. Us chefs did it together sometimes, there was something therapeutic about it after a long day’s work…wetting the stone and scraping the blade until it was in perfect form again. I also spent some time with a Japanese man at his store and he sat me down and gave me a lesson. Some knife stores will give you a lesson for free and it is worth it. I use a wet stone with a finer grain on one side and a courser on the other, usually 3000/600. The diamond stone or steel works quicker but will wear your knives down a bit faster. I have tried in vain to get a DMT stone in Montreal and they are not sold in Canada. To have it shipped would be a virtual fortune for weight. Is there something Opensky can do on a flat fee for shipping, if they have begun shipping to Canada? At the outset they were charging the same fees to ship xborder as they did within the States; but that quickly changed and last I heard they had stopped shipping to Canada altogether. Also I have some info for those people who have the fortune or misfortune of owning ceramic knives that have to be sent back to Kyocera: there is now a sharpener made especially for ceramic based knives that can be bought through Kyocera or Golda”s Kitchen Supply. The model is KY3050 and anyone who owns one of these knives will now be in debt to me: they are so bloody hard to sharpen especially if they fall and chip. Lee Valley might be worth checking out. They are based out of Ottawa. no luck they carry only water stones brand which is not diamond based. They are smooth and meant to be used wet. These look to be similar to the ones in the sharpening video. Lee Valley is a good suggestion. You can also try sharpeningsupplies.com – I believe they ship to Canada. If neither of these work, please contact me at mbrandon@dmtsharp.com and we’ll find a way to get you your DMT whetstone. I would get the DMT from you but i already have an assortment of grits! I also have Smith brand that i got at Lowe’s. i recently got hooked on Japanese knives and Chinese cvleavers. Sharpening them is a whole differnt ballgame from my German knives. I got some water stones for the Japanese/chinses knives. Still trying to find the right combination of grits for the. I’m at 1000 then polish with 3000. I trird to finish with an 8000 but the edge seemed too slick. There is such a thing as too sharp for kitchen knives believe it or not. Everyone who cooks should learn how to sharpen their own knives. It’s theraputic. anybody know the “dot” color or grit of the DMT sharpener being offered. Missed it twice now, hard to get on computer @ work. For me, this is the issue : Do I want to put a sharp knife in the hands of the average home cook? I used to preach the virtues of using a sharp knife to anyone who asked or showed interest in knives, and how learning to properly sharpen a knife is indispensable in the kitchen. It’s not just the sharpness of the knife, but proper knife skills and handling. How to hold the knife, how to hold the food being cut, what motions to use …these are skills that must be learned along with keeping one’s knife razor sharp. As for sharpening…that can be simple (Chef’s Choice) or it can approach zen-like mysticism (Diamond stones, whetstones, grit progression, stropping, stropping compounds, honing rods, bevels, secondary bevels, asymetrical bevels). I buy into the school of thought that dull knives may be more dangerous. You’ll hurt yourself on either if you hit your own hands (or whatever). But dull knives cause us to use a lot more pressure and may get deflected at odd angles and so on. Kershaw/Shun offers a free sharpening service. I just ship my knives to their Oregon facility and they’ve always gotten them back to me within a week. It’s my understanding that they have discontinued that service, at least for newly purchased Shun knives. They now direct customers to a professional sharpening service that charges a modest fee. Check their web site for details. “A dull knife will smash through the onion cell walls rather than slice through them, losing more juices, so it’s arguable that a sharp knife actually results in better tasting food.” I,m very agree with this quote. If you want more healthy food, we should use more sharpest knives. I think ineed to practice. tried this for the first time today on a 3″ folding knife (stainless), It was completely blunt before, it’s a bit better now, but by no means truly sharp. Do I need to grind more agressively, for longer? I remember I used to cut veggies with a steak knife, when I bought my first decent sharp knife I was amazed lol. Definatley makes a huge difference. Fishing season is coming up. That means I will be cleaning lots of fish and not doing it in my kitchen. Along with my filet knife, I put my Forschner diamond sharpening steel in the backpack. They do eat up a bit of metal but they also put a great edge on. Especially when butchering rockfish or salmon. I filet by placing the blade against the spine and running it throught the ribs, then cutting out the rib section. This is rough on a blade and after 20 or so fish it really helps to have a tune up. Check them out and add them to your OpenSky. Also I am in complete agreement with your recommending of the Ikon series knives. I have a santoku from that line that is usually the first knife I grab in the kitchen. For anyone in the Boston area, you should check out Stoddard’s. They will sharpen, or sell you sharpening tools. They also teach a class on sharpening that I took and wrote about for the local public radio station’s food blog. I bought a Kyocera diamond blah-blah sharpener and wound up with spectacularly dull Henckels. Reason? My dad says the Japanese have differently sharpened blades than the Germans. Anyone else? Love the comment about knife sharpening attaining a zen mysticism like state. But for those of use that are simply about sharp knives and keeping them that way I would agree that there is really no substitute for a professional sharpening, by someone who really knows what they are doing. Honing a knife regularly will keep you away from the professional sharpener for a longer period of time. For those that really enjoy sharpening on a whet stone with a free hand method that’s great, even after thirty years of professional cooking I have never been fully satisfied with my skill level at that. My personal recommendation for a home (or professional kitchen) is a system called Edge Pro, from Apex, made in the US there, for us Canadians it’s available from Paul’s Finest out of Montreal. Water stone system, still sharpening by hand but with a perfect guide set up, any angle required so it works well with your German steel or your Japanese knives, even your utility or hunting knives. It’s a little pricey, but as most people commenting here would agree, a razor sharp knife is priceless. A few years ago, I had a moment of out of body cloud gazing while chopping parsley with my just sharpened knife. It took less than that moment for me to cut off the top of my middle left finger. Since then, I’ve forced myself to maintain a monk like presence with my knife. This is the most important rule of knife cutting, I think. Stay there. RIGHT there. I guess it all depends. When slicing a commodity box of mushrooms, I often found that spacing out or even talking to my fellow prep cooks was the only way to get through the monotony. That took a lot of muscle memory and confidence, but none of us ever cut ourselves during prep. In SoCal look up “Perfect Edge Knige Sharpening.” They work mostly out of Kitchen Stores… You bring them to the store and a rep comes by once a week to sharpen them. They do a fantastic job on both German and Japanese knifes and the price is very reasonable. I saw the same thing at opensky. I googled the part number and found it for $46. Just sayin. It can’t possibly be the same thing because OpenSky worked directly with the company that makes the sharpener to undercut Amazon. You might be right about the base. I just ordered “something” for $46. I’ll let you know what arrives. I’m what you would call a serious home cook. I have a dozen or so Wusthofs. I sharpen them all every four to six months or so with the Chef’s Choice sharpener. In between sharpenings I give a knife a few passes with an Accusharp device (www.accusharp.com) when I pick it up to slice or chop something. I have found the Accusharp to be functionally much better than a steel, and there is no learning curve. I’ve tried several manual sharpeners over the decades, and the Accusharp is the only one I’ve found that actually sharpens the dang knife. I always recommend it to my dull-knife friends. Actually, I’ve given the things to some of them. I’ve noticed that the cuts and gouges I’ve sustained tend to happen not when I am actually slicing or chopping something, but in other ways–reaching for a knife absentminedly and poking myself with the tip, or having it slip out of my wet or fat-slippery hand and contacting the edge while reflexively trying to grab it back, etc.–situations where the usual knife skill safety factors (e.g. the “bear claw” grip) don’t come into play [insert here sound of knocking on wood]. Way back in my line cooking days, I cut off a small piece of my finger tip while slicing some scallions. It was only after staunching my wound and getting out the order that I realized I couldn’t find the piece of flesh I’d cut off. I’m pretty certain it ended up in a customer’s nachos. …But yeah, sharp knives! My finger healed in just a couple days! Any advice for dealing with a dull serrated knife? We’ve gotten into sharpening our other knives and it’s been great, but the old bread knives are pretty dull. I would love to watch this video, but it gives me an error “This video is private”.